While just the thought of doing math is enough to strike fear into the hearts of some children, it never hurts to add some ghosts and goblins to spice it up! This Halloween, to help spookify your kids’ math practice, we are sharing some of the most spooktacular math games we could find online. Ghost Blasters III has kids blast away ghosts while answering two-digit plus two-digit addition problems. Two players can go head to head to see who can take out the most ghosts. King of Math enlists kids’ help with defeating the hordes of zombies that are rapidly descending on the castle. The game covers math skills from Pre-K through 8th grade, so kids at all levels can conquer the zombies that head their way. MathMan: Multiple and Divide has kids solve multiplication and division problems as they guide MathMan around the screen and encourage him to take out the ghosts. Don’t think it sounds scary? Wait until you’re surrounded by ghosts and have mere seconds to figure out which one to eat before they eat you. Pumpkin Multiples features pumpkins falling from the sky. Kids must collect only the pumpkins that are multiples of a given number or they’ll find themselves earning an eerie low score. Teddies and Monsters may not sound very scary. After all, what’s spooky about teddy bears? However, kids will find plenty to spook them as they try to save the teddy bears by knocking the monsters into the hot lava. Escape from Fraction Manor features the creepy background music, spooky ghosts, and other quintessential aspects of a spooky Halloween game. Kids must avoid the monsters and collect all of the cards to reveal fraction puzzles. 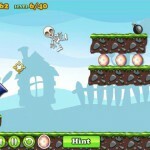 Skeleton Launcher 2 is full of skeletons that kids must launch from a cannon to crack the egg. The game helps teach kids about angles, geometry, and basic physics concepts. Spider Match Integers may look like it’s full of cute, smiling spiders, but the intensity of the game as kids try to match up positive and negative numbers to make a given number will be enough to frighten kids a little this Halloween. Full Moon has kids explore the nighttime scenery to find food for the hungry rabbit. They’ll explore the shadows created by the light of the full moon and discover the surprises that hide behind them. Monsterjong takes the classic game MahJong and adds a bit of spookiness. Kids must match tiles with similar attributes to clear the board. Unlike traditional MahJong tiles, these tiles feature creepy crawlies and other scary Halloween characters. Our honorable mention, Skeleton, focuses more on science than math, but it’s the perfect Halloween game to introduce kids to the skeletal system and creep them out a little as they watch the different parts of the skeleton move. 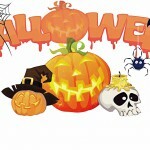 Do you know of any other games designed to help kids learn math and have a bit of Halloween fun? If so, share them with us. We’d love to add them to our collection.